Ombre styles are so versatile, which explains why they have been trending for so long. Whether it is a naturally sun-kissed look you’re seeking or a bold rainbow fade, there’s a style for everyone. The best part is that ombre styles are super low-maintenance and you don’t even have to dye your entire head. It is one of the easiest looks to achieve, especially if you are a dark-haired woman. 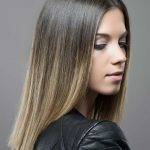 In this article, we’ve put together a list of 20 gorgeous dark ombre hairstyles that are sure to get you inspired. But first, let’s look at how simple achieving the ombre look is. Work with hair that hasn’t been washed in a couple of days. This will help the coloring process. Brush out your hair to get rid of any knots or tangles. Divide your hair into 4 quadrants and secure them with hair ties a little above where you want the fade to begin. Wear your gloves and put on an old shirt that you wouldn’t mind getting stains on. Apply the vaseline all along your hairline and on your forehead, ears, and neck. Following the instructions on the box, mix the colorant and developer. Apply the mixture onto your hair with the applicator brush. Start with the lower lengths for each section. Work your way up, one section at a time. Once you have covered all the sections, leave the dye on for the specified amount of time. If you’re going for a high contrast look, one of the easiest ways to achieve a perfect transition is to start the fade on the higher lengths of the hair. The dark brunette hair on this style fades to a beautiful baby blonde. The undertones in the style are cool, making this the perfect look for women with cool-toned skin. There are few styles that beat the simple charm that rich chocolate locks have. 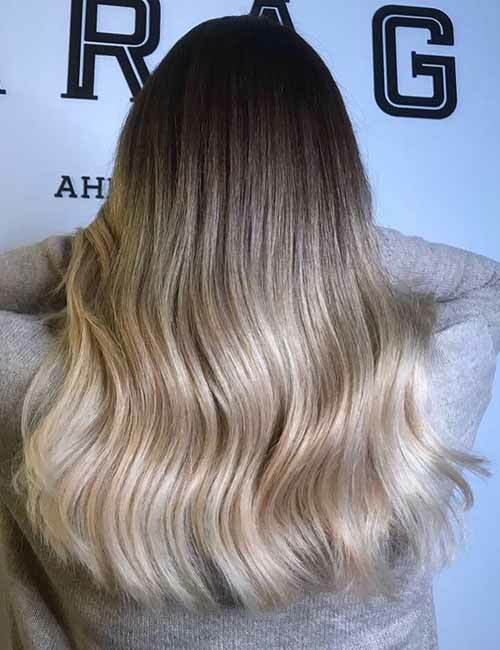 This style has been painted with a balayage ombre technique. The chocolate highlights begin close to the roots and the artist has incorporated a subtle fade. The style is perfectly textured and is sure to suit most skin types. 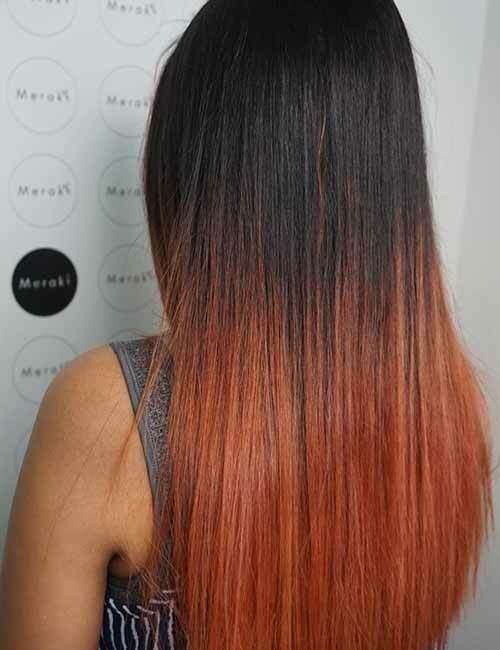 This ombre starts very close to the roots and begins quite abruptly, emphasizing on the boldness of the style. 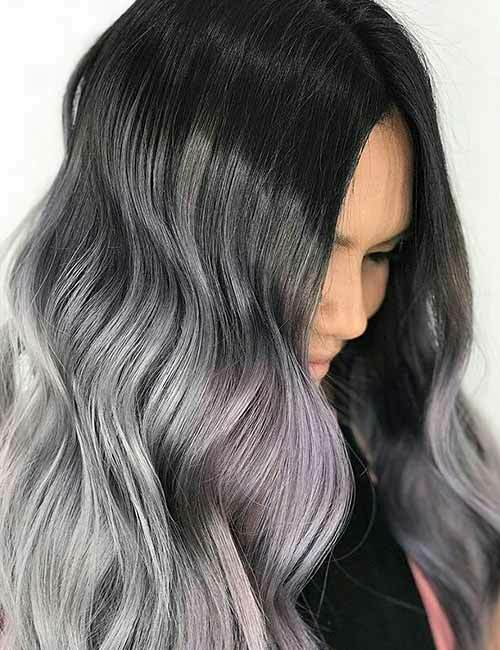 The dark gray has a subtle transition to a lighter color that takes on lilac tones on the way. The splash of lilac in the mid-lengths of the style helps add movement. If you have black hair and want an unnatural color that will seamlessly blend out of your natural hair, this is the style for you. 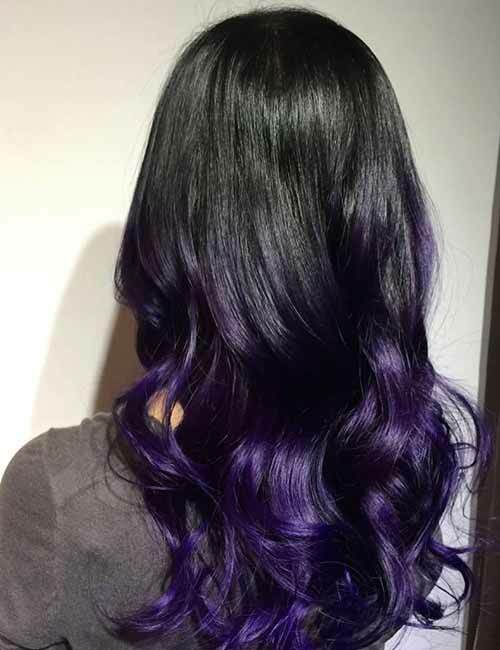 The natural black color of the hair transitions to a midnight purple at the mid-lengths of the hair. The color then fades to a vivid eggplant purple near the lower lengths. 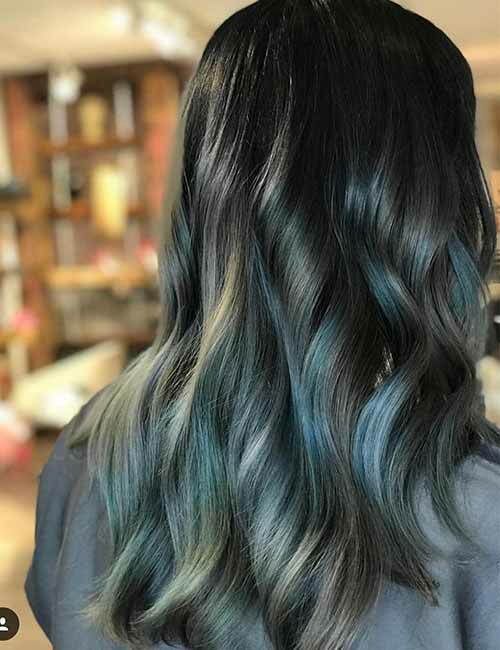 The cool tones on this style make it ideal for women with cool-toned skin. 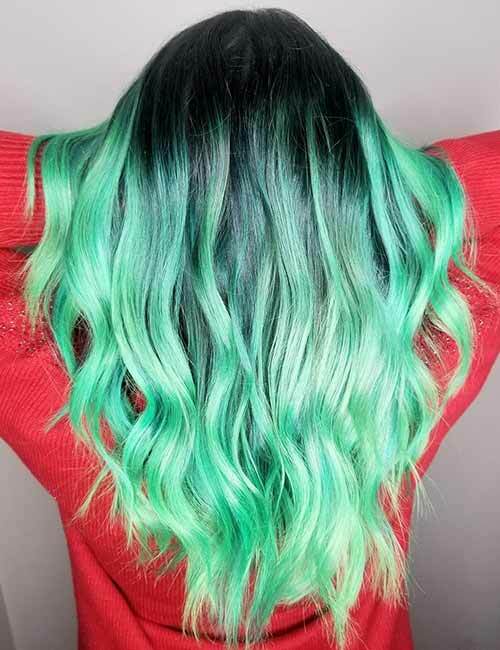 Green is your best bet if you want to try out a pastel color but have extremely dark hair. The yellow tones of your hair after pre-lightening will only accentuate the dye instead of canceling it out. This is the perfect style for women with olive or neutral skin tones and dark hair. The best thing about an ombre is that you can customize it to perfectly frame your face. 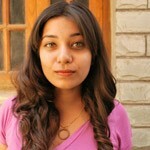 This is one of the best face-framing ombre styles that we have come across. The dark brunette hair fades to a pale blonde. The artist has begun the fade very close to the roots, near the framing strands. Blue is one of the most popular choices when it comes to unnatural shades. 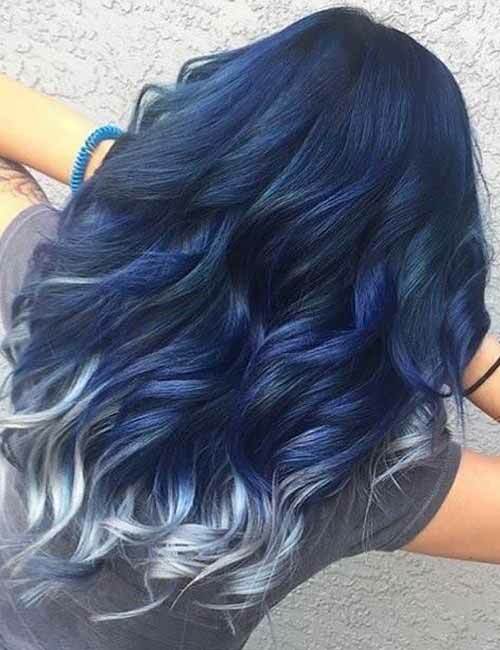 This amazing style fades from a dark black to a deep midnight blue. The fade begins very close to the roots and the color becomes more vibrant at the mid-lengths of the hair. The lower lengths abruptly fade out to an icy blue-toned platinum. This is one of the coolest styles (pun-intended) we’ve come across. If you are not seeking extreme change but merely want to add some subtle dimension to your hair, this subtle fade is the way to go. The dark brunette locks go half a shade lighter as you move down the length of the hair. This style is sure to look fantastic on anyone, regardless of the skin tone or hair type. 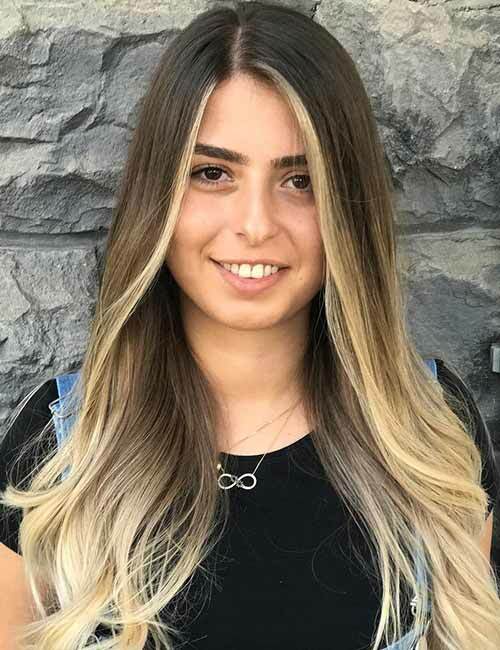 Smooth transitions on hair with high contrast is so hard to achieve, but this hair artist has certainly nailed the look in this style. The dark brunette locks have golden tones that begin very close to the roots. The hair then starts to fade to a beautiful light golden-blonde near the mid-lengths. The colors on this look are slightly cooler than a typical golden fade. 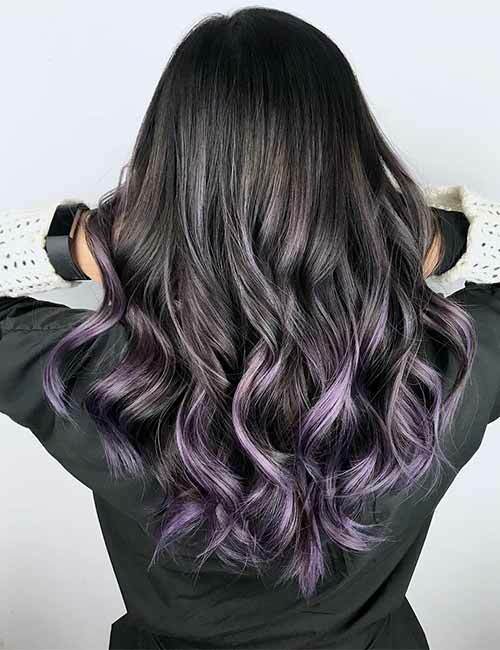 Lavender is a popular choice for women with light hair, but this dark twist on the look has us so completely mesmerized. The almost black natural color fades to a beautiful ashy lavender near the low lengths of the hair. The artist has perfectly toned the style to get rid of the cool tones, giving the look an ashy finish. This style is perfect for women with cool and olive skin tones. The best thing about rose gold is that it perfectly complements the brassiness that dark hair tends to retain after being lightened. 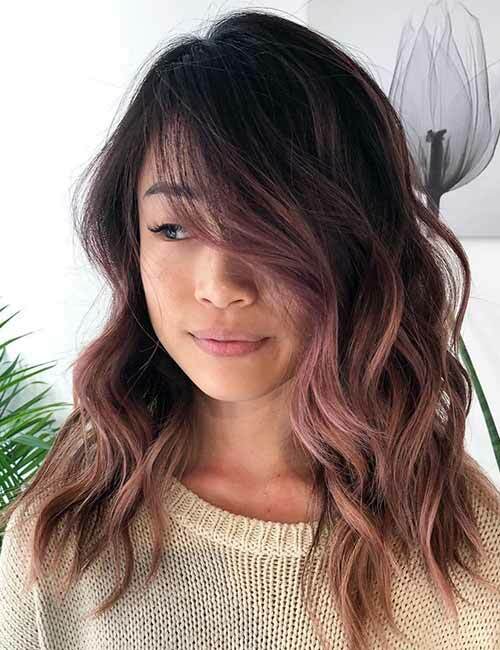 This rose gold look has subtle purple undertones that help cool the look down, making it extremely versatile in the sense that it is sure to suit everyone regardless of the skin tone. 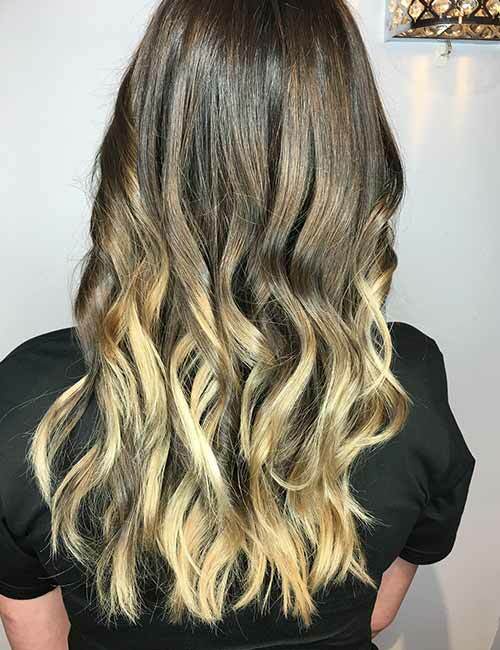 This balayage style ombre is what most of our dreams are made of. When you are as in love with unnatural colors as we are but have work or school restraining your inner unicorn, a style like this is the perfect compromise. The dark brunette hair has been painted with a lavender-toned purple. The color is woven through the natural brown, creating a sweeping fade. Everything below the mid-lengths of this style has been pre-lightened and painted with shades of teal and gray. The pre-existing warmth in the style has also created green undertones, painting a perfect under-water portrait. 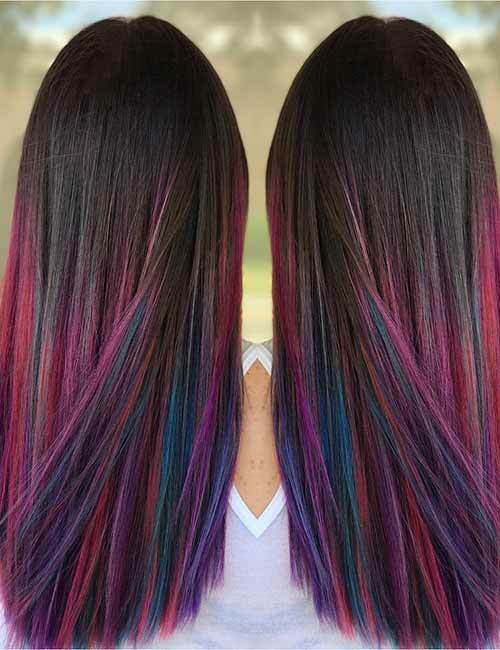 If you have extremely long and dark hair, you should know that an ombre style is the best way to go. There are few things that look better than the gradual fade you can achieve on long hair. The length of the hair helps you achieve a high contrast look with an extremely smooth fade, like on this style. The dark brunette roots gradually fade to a beautiful golden bronde. Red violet is one of the best colors to experiment with if you want a subtle yet slightly unnatural color. The color is extremely warm and works so well with dark hair, like in this style. 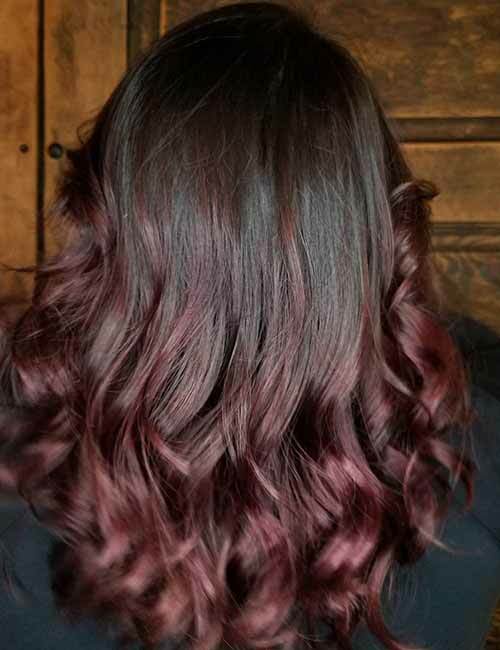 The natural brunette melts into a gorgeous red-violet. This style is sure to look good on women with warm and olive skin tones. If you love pink but don’t want to lighten your hair too much, this is the color for you. 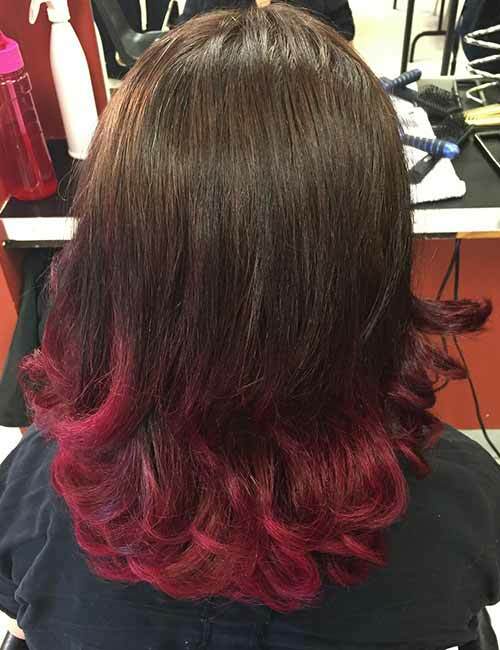 The natural brown base fades to a vivid and pigmented pink at the lower lengths of the hair. This shoulder-length style is going to be low on maintenance and you won’t even have to pre-lighten your hair too much to achieve that vivid pink color. 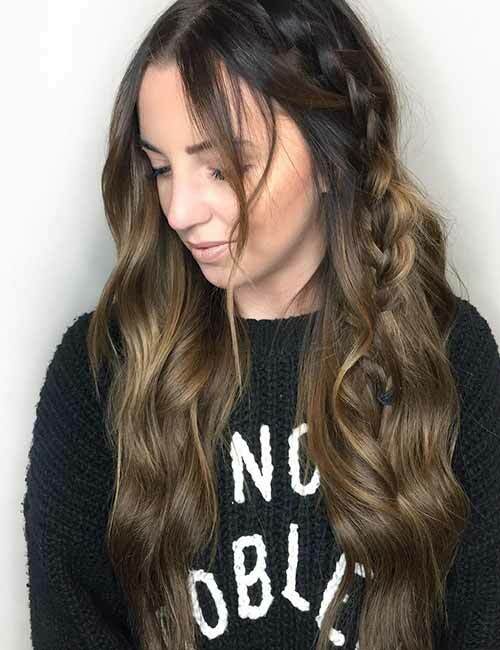 We love our dirty browns and this subtle ombre is definitely on our list of favorites. The dark brunette hair starts to fade below the crown. 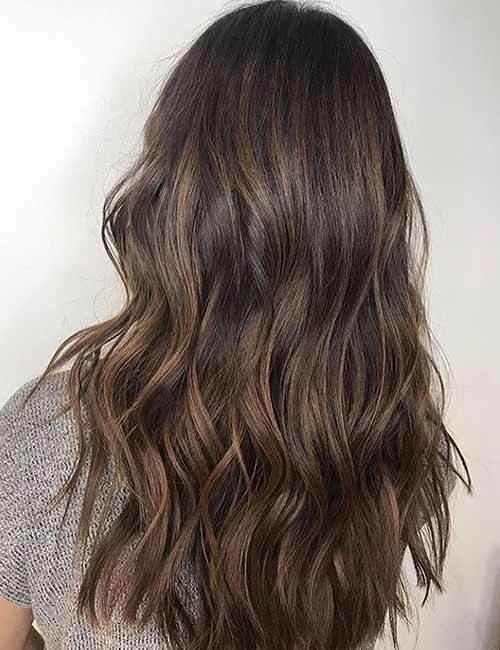 The rich brunette then takes on a cooler dirty brown color, which has been highlighted with subtle dark blonde streaks that add dimension and movement. Dark hair is loaded with warm tones, and so, this warm, brassy styles is one of the easiest looks to achieve. In this style, the dark brunette hair has been expertly blended out to a brassy auburn and we are in love with the result! 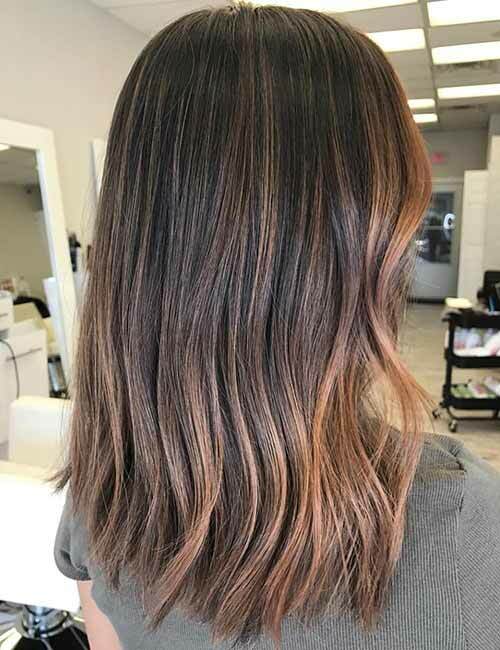 If you are looking for some highlights with a subtle fade, a balayage ombre is the way to go. For this style, the artist has incorporated fine highlights all around the hair with heavy lights near the framing bits of the face. The lights also grow heavy at the lower lengths of the style. This kind of a highlighted ombre is perfect for women with fine hair looking to add texture. 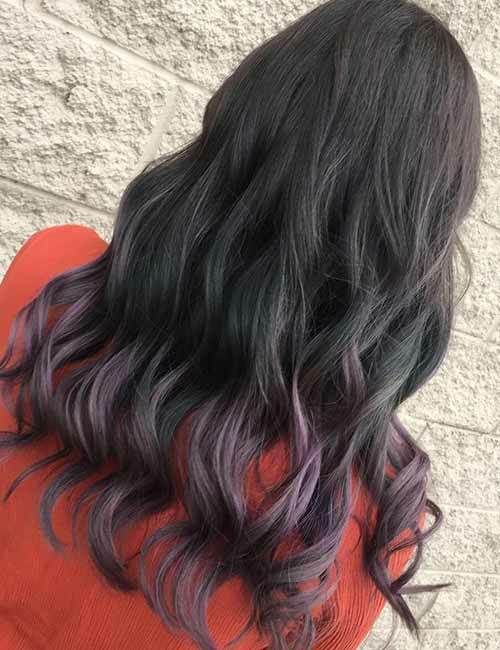 If you love the unicorn hair trend and have been dying for some multi-colored locks, this colorful ombre might be just the style for you. The dark brunette locks fade to shades of purple and blue. The colors are vivid and have been painted on to create a beautiful sweeping effect. With so many options available, making a decision can be hard. A few things that can make the decision-making process a whole lot easier is asking yourself whether you want a subtle or solid ombre and what colors you want to work with. Taking your natural hair color and skin tone into consideration can also help zero in on the perfect style for you. What do you have in store for your hair? Tell us in the comments section below.